As Valentine’s Day is one of those unavoidable consumer holidays, in our classes we use the weeks leading up to Valentine’s Day to talk about love and what it means to us. It is fascinating to listen to children discuss who they love, why they love them, and what they can do to express their love. We talk about all the people in our lives that love us and that we love in return: mothers, fathers, teachers, nannies, siblings, grandparents, cousins, friends, even pets. We then set off on a week or two of making homemade cards for all of them. We use Valentine’s Day to actualize the lyrics of one of our favorite songs, “Love is Something if You Give it Away.” We like to have children take time out to make or bake something special for the people they love and give it or mail it to them. Here, we welcome art teacher and blogger Christina Soriano to the Shine family. She shares a couple of quick, fun, and surprisingly beautiful art ideas for homemade valentines. And remember, a great way to give back around Valentine’s Day is to make cards for your local senior center. Many seniors don’t have a valentine and to receive a handmade card from a child means more than chocolates or flowers ever could. What better way to illuminate the true spirt of of a holiday that could leave so many feeling lonely. Start by lightly drawing a heart on your stationery with pencil. Glue and overlap the small pieces within the shape until it is filled in! Glue on gold sequins or other embellishments! This is one blinged out greeting! Using a pencil, lightly draw a heart on the stationery surface. Take the embroidery needle and poke holes through the pencil lines to create a stitching pattern. Thread embroidery needle and make sure to knot the end. Sew through stitching lines using running or backstitch. Either one looks great! When sewing is complete, knot on the opposite side of the paper and cut off excess thread. 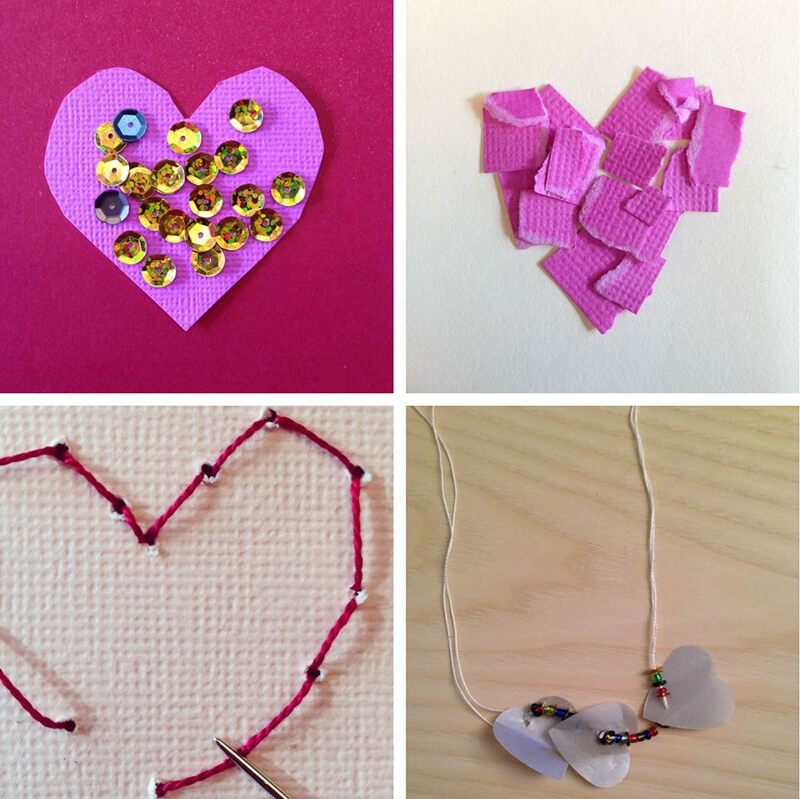 Go the extra mile and adorn your Valentine with a handmade necklace or bracelet depending on how long your string is! Estimate and measure the length for embroidery floss or string. Make sure it can fit over a child’s head safely. Be creative and develop your own color patterns. There are no rules for creativity here! Don’t forget to write a personalized handwritten greeting in each card you give out or send in the mail! Happy Valentine’s Day!